There is no one-size-fits-all solution for public engagement, especially online public engagement. Different issues and target audiences require different methods of engagement. You may decide that a survey is ideal if you only require a basic level of engagement, that is, no two-way conversation. However, true engagement requires a genuine dialogue in order to identify citizen concerns, create alternatives, and mitigate potential harms. While many platforms offer a single standalone tool (such as a survey or a ideation exercise), PlaceSpeak offers a wide range of robust features, which can be used in combination for a truly collaborative, open and transparent approach to public consultation. Offering a wide variety of public engagement tools allows people to participate as much or as little as they like. By using a combination of features, you can ensure the collection of reliable quantitative and qualitative data. As always, having a layer of authentication is key if you want to use your data to make evidence-based decisions. The first step on the IAP2 Spectrum of Public Participation is “Inform”. People cannot be expected to provide sensible feedback if they are ill-informed about the issue at hand. Your consultation website should include a library of background information which will enable citizens to be well-informed and properly equipped to participate meaningfully in the discussion. This may include photographs, diagrams, graphs/charts, videos, documents, or Web links to additional articles or pages. This information should answer the following questions: What is the project being proposed? What are the benefits, costs, and/or consequences? How will key stakeholders be impacted? Why is their feedback important and how will it be used to impact the final decision? These simple polls are most commonly found on the websites of media outlets, asking readers, listeners or viewers for their opinions on a certain topic. They are one of the most straightforward ways to engage at a basic level. 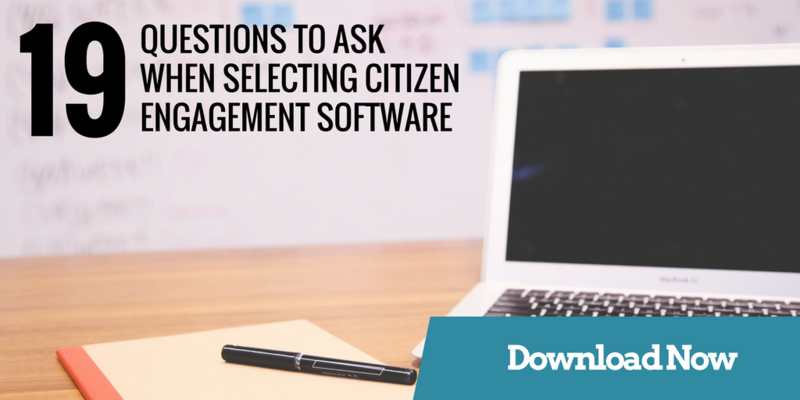 A quick poll is an easy tool to include in any online public consultation. Providing a low-effort option is perfect for people who want to engage, but don’t have the time or ability to participate on an in-depth level. Participation doesn’t take much time, and instant poll results provide a snapshot of public sentiment around a specific question. Poll results can be easily visualized in the form of graphs, charts, or even maps (seen below). Most organizations are already using surveys during public engagement. A survey is the most efficient and cost-effective way to gather aggregate, large-scale data about a population of interest. With more questions than a quick-fire poll, a survey allows you to explore topics in greater depth and correlate data from different variables in order to draw conclusions. 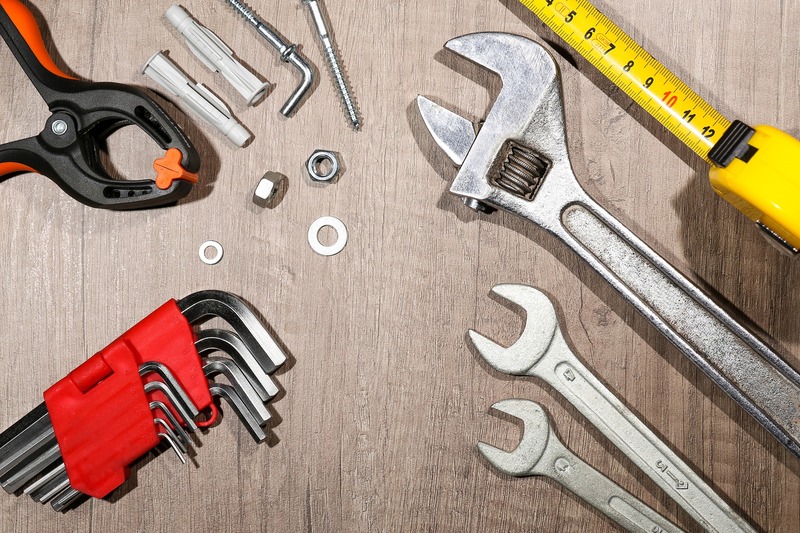 Be sure to refer to the many resources out there on how to write a good survey. In order to build public trust, ensure that your survey is unbiased and does not contain leading questions seeking to influence the results. After the survey is completed, demonstrate additional transparency by publishing the results to show how participant feedback was taken into account during the public input process. While a survey can tell you what people think about a certain issue, it’s harder to determine why they feel a certain way. Discussion forums or boards allow you to take a more in-depth look at the causes or reasoning behind respondents’ approval or disapproval of a given measure. For example, 52% of Americans disapprove of the Affordable Care Act. However, these numbers don’t paint the full picture. Further insight into respondents’ views indicated that while many people disapproved (predictably) due to cost or partisanship, others disapproved because they felt that the bill didn’t go far enough in providing health coverage. This sort of nuance around serious policy decisions cannot be gathered solely through polls or surveys. However, conversations on a discussion forum can get heated — trolls and spammers can derail the conversation and create a crude, unwelcoming environment that deters well-intentioned citizens from participating. Learn more about problems caused by anonymity and how to mitigate it. 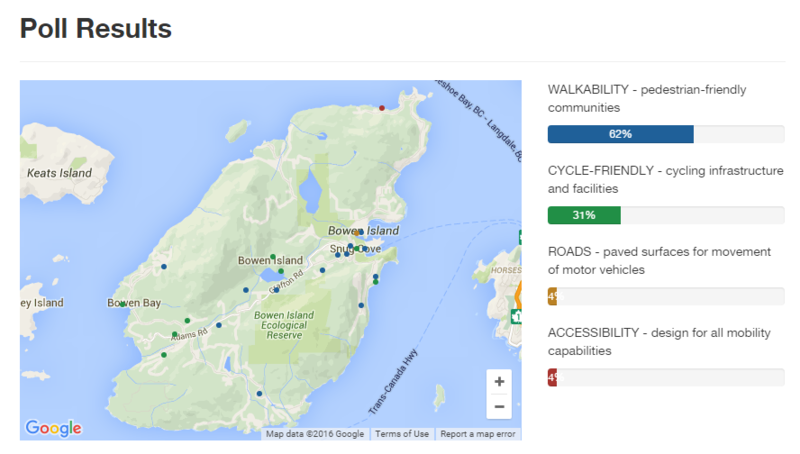 Going beyond the whats and whys, many online public consultations require a more spatial approach — the “where”. 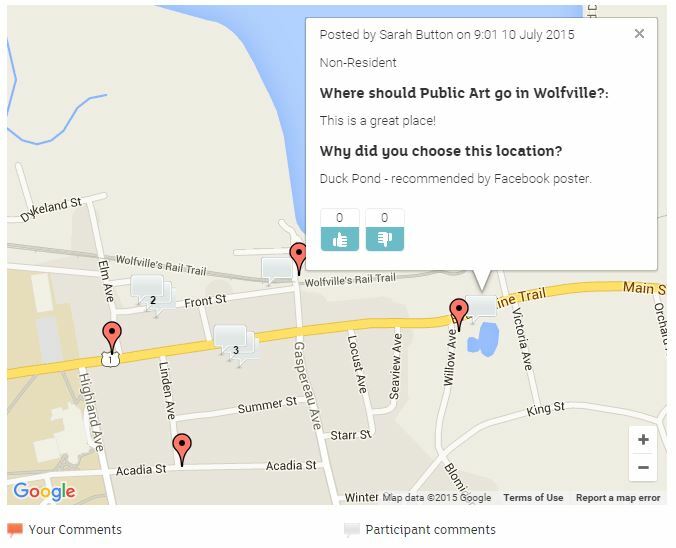 In the Town of Wolfville’s Municipal Planning Review, they asked residents to identify locations for public art. This was a much more interactive and easy option than asking people to describe or write down the addresses of suitable areas. Other examples may include asking residents to mark on a map where they would like to see more street lighting, or indicate problem areas in their neighbourhood which might require more traffic calming features or stop signs. How can your public consultation be successful if no one knows about it? Make sure your tools makes it is easy for participants to share the link to your consultation page by integrating social media share buttons. Additionally, embedding your own social media feeds on your consultation page can be a good way of building extra publicity around your cause or issue. Learn more about how you can use social media for promoting your public consultation here. Are you engaging on a one-off basis, or are you building strong ongoing relationships with civically engaged residents? Ensure that your public consultation platform has the ability to notify participants on an ongoing basis. Keep participants informed throughout the project of new developments and changes, and ensure that they are able to participate at all steps along the way. In addition, PlaceSpeak is the only public consultation platform that allows organizations to tap into existing users in the area — instead of starting from scratch every time, a new public consultation launch will notify all PlaceSpeak users in the area, who will have the opportunity to participate in your consultation. Finally, it is crucial to “close the loop” on your public consultation — notify participants of the final decision and let them know how their feedback made an impact on the outcome. When people are able to see the tangible effects that their input has had on a project or issue, they are more likely to stay engaged and participate in future projects.